The Samsung Galaxy Tab S 8.4, as the name suggests, is the smaller of the two newly announced slates. It is super thin and light - an achievement made possible perhaps thanks to the Super AMOLED screen. Speaking of which, this one has WQXGA resolution (that's the same as on the Galaxy Tab Pro lineup - 2560x1600px). It borrows the Galaxy S5 flagship design to the tiniest of details - the faux-leather plastic back, the control deck at the front, the fingerprint scanner on the Home key, the earpiece grille - the Galaxy Tab S 8.4 definitely looks like a supersized Galaxy S5. Samsung will be offering the Galaxy Tab S 8.4 in two colors - dazzling white and titanium bronze. The latter has a dark gray front glass, with bronze framing and bronze dotted back. The Galaxy Tab S 8.4 has the usual stuff at the front - there is the control deck with capacitive Back and Task Switcher keys flanking the hardware Home button. Just like on the Galaxy S5, the Home key of the Galaxy Tab S 8.4 doubles as a fingerprint scanner. As we said, the back of the Galaxy Tab S 8.4 is pretty much the same as what we saw on the Galaxy S5. The camera is 8MP with a single LED flash and there is no heart-rate monitor. You'll notice two strange circles - these are the dedicated magnets for the flip covers. The Galaxy Tab S 8.4 features stereo speakers - they are at the top and bottom of the slate. Samsung placed those such as no matter whether you are using your Tab S 8.4 in portrait or landscape mode, you won't muffle them. The right side is pretty crowded - here you'll find the power/lock key, the volume rocker, the IR blaster and the microSD slot. If you opt for the LTE-enabled Galaxy Tab S 8.4, you'll get an additional earpiece above the display. The slate supports voice telephony and while we guess it may look somewhat awkward and inconvenient to put the Tab S 8.4 to your ear, you can go for it if that's your thing. Just for the record, the original Galaxy Tab 7.7, Samsung's first tablet with Super AMOLED display, had the same earpiece. Here is a peek at the back of the LTE-enabled white Galaxy Tab S 8.4. The microSIM slot is right next to the microSD on the right side of the tablet. Just like for most of its Galaxy smartphones and phablets, Samsung will be offering flip covers for the Galaxy Tab S series. The original cover for the Tab S 8.4, once attached, leaves almost the entire back exposed but would protect the entire front. It doubles as a stand too. You will be able to buy the flip covers in other colors as well. Samsung Galaxy Tab S 8.4 is surely a very thin and light device. 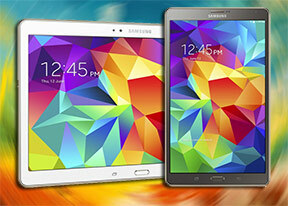 It is 6mm shorter, 2mm narrower, almost a millimeter thinner and 40g lighter than its Galaxy Tab Pro 8.4 sibling. Yet it manages to pack even better hardware and slightly bigger battery. Here is an overview of the newly announced slates. They are definitely a thing of beauty. The Samsung Galaxy Tab S 8.4 runs Android 4.4 KitKat skinned with the latest TouchWiz UI and Magazine UX. You've probably noticed the interface on all of our photos. It is pretty much identical to the software package on the Galaxy Tab Pro 8.4, but we have to admit everything looks livelier on the punchy AMOLED effect.